You want to help him but you do not know what to do. What does he need? Do you have to call an ambulance? As the coughing and wheezing does not stop, you decide to call the ambulance. With shaking hands, you type in the number and call the paramedics. It does not take long until the ambulance arrives and your friend is transferred to the nearest hospital where a team of doctors is waiting for him. After treatment, one of the doctors tells you that your friend has had a severe asthma attack but he is feeling better now. He must have inhaled some sort of trigger that led to inflammation in his airways which made his airway muscles contract. As a consequence, his airways became narrowed making it difficult to breathe. The doctors were able to give him some medication that relaxed his airways making it easier to breathe again. Unfortunately, there is currently no permanent cure for asthma and your friend was lucky he did not die. To find new, more effective treatments, it is important to understand the underlying mechanisms of asthma. When breathing in, one of the first cell types that greets the inhaled particles are called ‘macrophages’. These are immune cells that love to eat up particles in the inhaled air by a process called ‘phagocytosis’. Then, they decide if the particles they ingested are harmful or not. As well as enjoying a good meal from time to time, macrophages are also chatterboxes who enjoy talking with other cell types in the lung, such as the ones lining your airways. They tell them about the things that they find. Macrophages inform these other cells if the particles in the inhaled air are harmful or not. The macrophages recognize that if the particles in the air inhaled are not dangerous, nobody needs to over-react. However, if the macrophages think the particles are dangerous, it’s time to call in reinforcements. Regarding your friend who had an asthma attack, the macrophages made a mistake. For some reason they thought that a harmless pollen particle was dangerous, and told all the other cells to panic. To understand asthma, we need to first understand why sometimes macrophages give this wrong information to the surrounding cells. Macrophages that spend all their time nattering to other cells and gobbling up inhaled particles need lots of energy. They can use different mechanisms to produce the required energy depending on what the energy is needed for and also on what kind of pathogen the cell encounters. In order to react to harmful particles in the inhaled air, it needs to produce energy as fast as possible. For this purpose, macrophages rely on glycolysis, a process that quickly converts the sugar these cells use into energy. However, the yield of energy is very small. To produce high amounts of energy macrophages can turn on a different mechanism, called ‘TCA cycle’. This mechanism takes longer but it results in much higher amounts of energy. The aim of my PhD project is to study the way how the macrophages produce energy. This process of metabolism seems to be different in asthmatic and non-asthmatic people. Therefore, it is a major goal of my research to characterize which steps in the metabolism process differ and how they differ. To do so, macrophages of asthmatic and non-asthmatic patients are washed out of the lungs by so called ‘brochoalveolar lavage’. Subsequently, these macrophages are compared regarding the mechanisms they rely on to produce their energy to function as an effective defense against pathogens in the inhaled air. After finding and analysing potential differences in the metabolism of macrophages of asthmatics and non-asthmatics, it can be tested if these distinctions are the reason why the macrophages of an asthmatic react to particles in the inhaled air even if no reaction is needed. The subsequent step will be to test if drugs modulating the pathways of the energy production in macrophages can effectively treat asthma. Ultimately, if a drug like this could be developed then this would prevent people having severe asthma attacks. This drug would help to prevent that your friend gets another asthma attack and to avoid that he has to spend his holidays in hospital. Gesa Albers (@AlbersGesa) is PhD student within the Lloyd Lab at Imperial’s National Heart and Lung Insitute. 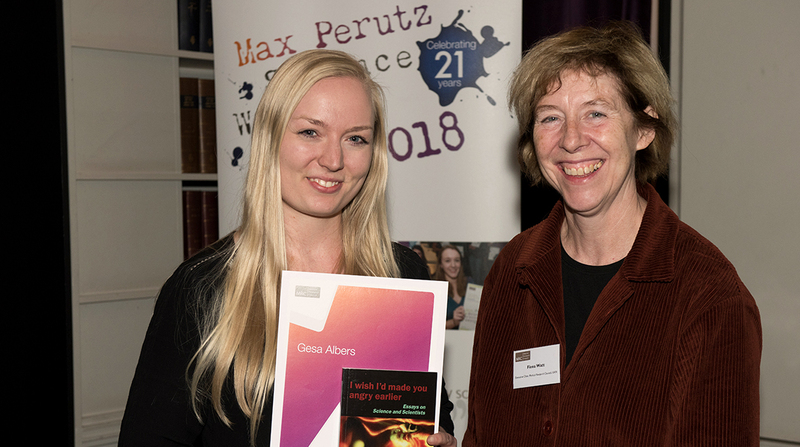 Read Upansa Tayal’s shortlisted article for the 2017 Max Perutz Science Writing Award.